I was looking through my notes to see what I could do for my next post. I was ill, up to my forehead in work and deadlines, and frustrated with people who could not keep the names of their characters straight, much less their ages and the chronology of events. More particularly, I was feeling totally wiped out by what seemed to be a cocktail of bugs all mutating inside me, and suffering withdrawal symptoms from watching too many serious, meaningful films. I needed a break. More than a year ago, when I was muddling through another boring day, I decided that it wasn't enough to make a list of 'My Favourites' that restricted me to that genre or category of songs. So I came up with Word Play. My excuse was that Hindi songs tend to use some words more than most, and so, why not find a way of listing my favourite songs that contain a particular word? What it more probably meant was that an idle mind is a devil's workshop. As my younger son says (and it makes me want to smack him! ), Whatever! The advantage, of course, was that these songs cut across genres, so it could be about love or heartbreak, meetings or separation, betrayal or philosophical musings. The settings could be rural or urban or in-between, and I didn't have to worry about defining the category I had set for myself, and explaining to my readers that no, that song does not count, because this is what I mean when I said that, and so on. This category of songs does not need any definition. There is only one condition - the song has to begin with the chosen word, or at the very least be the second word in the first sentence. (Preludes to songs did not count towards the condition.) I began the series with Raat. My second word choice is almost as, if not more, ubiquitous. Piya. Why not? Where would music and poetry and literature be without love? Where would we be without that blessed emotion? Equally obviously, one cannot 'love' without having someone to love. So, piya. In any case, after a wonderful time spent soaking in some wonderful, wonderful melodies, I had to pick out all the songs that fulfilled my condition, and from those, whittle the list to the songs that I personally love. Piya. Beloved. Priya, priyatam, mehboob, mehbooba... so many, many synonyms, so much emotion vested in the syllables. So here, in no particular order, are my final selections. I lied. I do have a favourite, and this is it. Waheeda Rehman has long been one of my favourite heroines, one of those fortunate few who seem to have it all, beauty, grace, talent, and she's a fantastic dancer to boot. This song is one of the finest demonstrations of her talent for dance. Set as a series of stage performances, Piya tose naina laage re is the perfect synergy of music, lyrics and its exposition - nearly nine minutes of it. There are other dances in the film; in Aaj phir jeene ki tamanna hai for instance, where she dances nimbly on the crumbling walls, or my other favourite Mose chhal, or the snake dance sequence, which is one of the best I have ever seen, where she forgets herself in dance. Another favourite heroine, Madhubala, and a lovely song that sings of the pangs of a first love. The lyrics are a bit more explicit in their longing than one would expect from a village girl of those times (we are used to more coy expressions of their regard), but still so innocent in their expression. The flute interludes are lovely, and the song ends with a long flute solo. Watching the clip (I saw the film a very long time ago, and have forgotten most of it.) I'm reminded that Madhubala may have been very graceful, but dancer she was not. This film had one of OP Nayyar's best scores, a dozen songs that included Ik pardesi mera dil le gaya (which borrowed the been music from the earlier Nagin) and Main soya akhiyan meeche. It's a different flavour of love, waiting for the beloved to arrive. Dressing up in anticipation, listening to each footstep and wondering if it is him, the anticipation veiled by innate shyness, the playfulness that is yet anxious, the feeling of losing oneself in another... Geeta Dutt's voice expressed every fluttering emotion in the wife's breast as she gets ready for her husband's arrival, and was mirrored onscreen by my favourite heroine of all time - Meena Kumari. A very playful romantic song, and with the music director's signature tonga beat, Piya piya piya had Asha Bhosle pairing up with her favourite colleague, Kishore Kumar. (The pair sang the most duets together.) A sulking Kishore, who miraculously cheers up when his beloved pops up from behind, a beautiful Chand Usmani and an avuncular father sitting beside a stoic cart driver, the song is beautifully picturised, with Kishore and his signature yodelling and Asha at her playful best. What was technically a recording glitch when Asha intervenes earlier than she should have, was papered over onscreen by Kishore gently closing his beloved's mouth, and continuing the song. It just made it seem all the more natural. The film is one of the many that are ruined by lackadaisical direction, no semblance of a coherent plot, and a hero who couldn't act (Deepak), but the heroine more than made up for all this. Shama was beautiful, could act, and this song is a perfect example - watch the expressions flit across her face. She is romantic and playful by turns, and is perfectly in sync with Lata's delightful rendering of this semi-classical number. The immensely forgettable film had an unforgettable score by Hemant Kumar that included multiple versions of the plaintive Na yeh chaand hoga and the romantic Dekho woh chaand chhupke. Picturised on Kishore Kumar and Jabeen Jaleel in a romantic mood, the lyrics fully express the nascent feeling of being in love. Funnily enough, Kishore has songs with both Jabeen and the film's heroine, Padmini, even though the film's hero is Ashok Kumar. Not one of OP Nayyar's greatest scores, but Raagini had the caché of having Mohammed Rafi playback for Kishore Kumar (Man mora baawra) and the classical Chhed diye mere dil ke taar kyun (sung by Pandit Lakshman Prasad Jaipurwale and Ustad Niaz Ahmed Khan Saheb). You cannot have love without separation, nor separation without the longing to meet one's beloved. What is love after all, if it is not put through trials and tribulations that make the heart grow fonder in absentia? Add in a heroine who has to face many troubles, and a hero who is dying of love for her, and you have the stage set for a wonderful paean to love and longing. (I could have done without the dying fish, though.) Saranga may have been what was often referred to as a B-grade film starring Jaishree Gadkar and Sudesh Kumar, but it had a stupendous musical score. I do not usually go beyond the 60s in my song lists, but sometimes, just sometimes, I make an exception. While collating this particular list, I found a few songs that I like very, very much. The golden age of Hindi film music may have passed, but there were still a few directors and music directors who kept the flag flying. The next three songs are indicative of an age, yet diverse in their scope. They may not (all) be everyone's cup of tea, but I think they have held their own through the passing of the ages. One of the few films in this period that used songs to pull the narrative along, it sets the tone for the rest of the film. Picturised on the beauteous Waheeda, the song celebrates the coming of Phagun, the month of Holi. Set against a Maharashtrian backdrop (another rarity in Hindi films), the rich Shanta (Waheeda) is waiting for her husband to come home, but is persuaded by her friends to take part in their celebrations. She gives in to their pleas and dances in exuberance only to have her loving husband come home and spray her expensive sari with rang. What follows next forms the rest of a very different tale by Rajinder Singh Bedi. It is interesting that this brings in a shade of love that is the most heartbreaking. What does you do when your beloved is angry with you for no fault of yours? When the quality that made him fall in love with you is the same quality that is driving him away? In a tale of a marriage riven asunder by ego, each line that she sings is indicative of her grief at his leaving, and how empty her life is without him. It is a grief that is heard and understood by their friends, yet he is unbending. One of SD Burman's last scores (he composed for less than a dozen films after this), he breathed life into the songs in a film that narrated a tale of how music becomes responsible for the disharmony in the protagonists' lives. I reserved this for the last because this is truly what I term a guilty pleasure. It is very different from the other songs on this list because even though it sings of longing, a) it is a nightclub number i.e., it is not really sung by a woman to her beloved and b) musically, the song veers from the softly romantic or folksy notes of the previous songs to bring in thumping western rhythms. RD Burman's music for this film traversed myriad genres, from the joyous Goriya kahaan tera des re to the crazy Daiyan ye main kahaan aa phansi (a song that Asha claimed was the most difficult song of her career) to this provocative, sensuous number; add Asha at the height of her vocal prowess, and a beautiful, graceful Helen, and one can understand why this song had become the anthem of a generation, and still holds sway over the airwaves. If I did expand my criteria to songs that had the word piya in the mukhda, my list would have multiplied manifold. Never mind. I can always find some category to fit them in. So many more movies to watch, so many more songs to list, so many more books to read, and so. little. time. Why don't you list some of your favourite songs for me? It's a fabulous playlist, Anu. Waheeda Rehman would top my charts too, not only is she extremely talented, and graceful, she also was lucky enough to have some of the most beautiful songs picturized on her. 'Piya' is indeed a WordPlay that can be quite exhaustive, rich and fabulous. ( There are several versions of this bhajan by Meera). Thank you, Banno. Agree with you about Waheeda having some really, really good songs to her credit. Ashokji maan gaye! :) You have an almost encyclopaedic knowledge of old film songs. The Meera bhajan from Jhanak Jhanak Paayal Baaje is a particular favourite even though bhajans in general are not my favourite genre. The link for Salone piya isko karo sweekar is the same as the link for Piya ka Ghar song; I changed it; it is such a beautiful song, isn't it? Not as popular as the other songs from the film, but such a quiet number. "Aaja Piya Tohe Pyaar Doon" has words that sound so innocent in Hindi. However, translated into English, I might go red! Lakshmi, *grin*. Quite a few songs like that, no? Aarattu kadavil in Malayalam always makes me blush, especially when I had to translate it for my husband once. Very beautiful theme, very restrictive though! Enjoyed each and every song in the list! Another song a non filmi but one I like a lot sung by various people and here by Shobha Gurtu. This is a Chaiti I can't make out the raga, it seems to be based on the Kafi thaat, leaning towards Bhimpalasri not sure though. Chaiti is derived from folk and sung in the month of Chait. Please translate for me as well! I have LIMITED knowledge of Malayalam... :( Such a shame. Piya sang khelo Holi is one of the most in-context songs I have seen. :) But yes, there are better songs. I actually liked Pardes you know, though the 'East good, West bad' message that they hammered into me made me cringe. It was a very well-acted film. Mera piya ghar aaya - that was Annu Malik copying Nusrat Fateh Ali Khan. :) On the topic, I wonder if I'm the sole person who doesn't really like Nusrat Fateh Ali Khan. Piya ki gali was on my shortlist, as was Piya milan ko jaana, but they are not my favourites so I dropped them; I'm glad you listed them here. Aah, now *that* makes sense! :) This is new to me, this song, so thank you for the link. 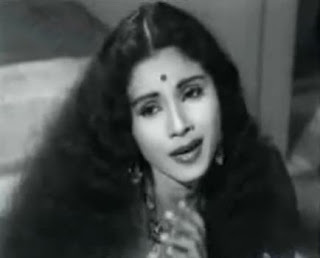 Sulakshana was definitely a far better singer than she was actress. I wish she had continued to playback. Lovely song indeed. Here? Eeks! One word of caution, though - please don't watch this on YouTube. The picturisation is awful! Chaiti is named after Chaitra (the month in the north its also called Chait). Originally derived from folk, with strong associations to romance and love, it is sung in semi classical formats. It is sung in March/April (Chaitra) and so is seasonal, and mostly in the Purabli dialect from UP and Bihar. I sounds like you haven't had the best of times these past few weeks, but I must say you get very creative in your boredom, Anu. :-) I like the word play concept very much - it's simple yet challenging. "I wonder if I'm the sole person who doesn't really like Nusrat Fateh Ali Khan. " No, Anu - you aren't the sole person. I'm not that keen on him, either. And the 'East good, West bad' message of Pardes really got on my nerves. It was so OTT and xenophobic and stupid. I kept wanting to yell at Amrish Puri's character: "If it's such a vile place, why don't you just come back to India?!" Really cringe-worthy film in places, though I agree the acting was good, as were the songs. Yes, the past few weeks, from mid-December onwards have been rather awful. This season has been so bad, the state has declared a medical emergency. I hope I'm over the bad stuff, though. The songs you listed? I had not heard even one of them before! I really loved Piya milan ki aas; The pathos in Lata's voice really tugs at your heart. Is that Sitara Devi in the second clip? What a lovely song. That is she singing too, isn't it? Neetu Singh looks oh-so-young and oh-so-pretty in the Andolan clip. :) Like a little girl all dressed up in modern clothes. Thanks again, Shalini, for introducing me to some 'new' old songs. Thank God, Madhu. During that period when he became so famous in India (due to MDs shamelessly plagiarising his songs) you could almost have been shunned for saying so! Pardes.. yup. Amrish Puri hammed it up so much, you could cut slices off him and make sandwiches. The only saving grace of the movie was the acting and as you say, the songs. Also, the basic concept of the two young people being friends, and the fiance suspecting her of infidelity - if they had stuck to that without all the West-bashing, it would have been a far finer film. Isn't 'sajan' also a synonym for 'piya'? Anyway, that's a nice theme and selections. 'Abhimaan' had Amitabh lip synching for 3 singers, that was weird noting the plot of the film where he plays a 'singer', I call that a blunder despite the fabulous music, my favourite in that was 'Loote koi man ka nagar' which I thought was sung by Mukesh for long. from 'Pujarin' ,yet another good Rafi song in a film no one knows about (like 'lagi choote na'). There's 'Pardesiya ye sach hai piya' from Mr.Natwarlal , my least liked Amitabh-Rekha songs and the film is confusing too, loved Loin Ajit's positive role in it though. lol. Just watching it now, might be the last 'saheli' song if I could call that. from 'Dil' , I despise this film (and Raja Hindustani) but still prefer Aamir of the 90s. I don't like DDLJ or Hum aapke hai koun either but prefer Salman and SRK of the 90s (maybe I'm crazy). Probably, after this film Saeed Jaffrey starting doing 'heroine ka evil baap who opposes the hero' roles in the 90s. Anyway, this song though a ripoff from a telegu song is the only thing I like in the film.ok there is another song I like 'humne ghar choda hai' even though it reminds me of a certain Rajesh K-Zeenat Aman song. Suresh Wadkar alongwith Yesudas are terribly underrated singers , I have never heard a bad hindi song from them yet and I have heard a lot. Sadhana Sargam is another one. Anuradha Paudwal was clearly better than Lata in the 80s and 90s . I'm inclined to believe the gossips (or were those true stories?) I remember in a film called 'Hero' , LP's music included the now classic flute music , I wished there was no Lata there. I do have a tendency of picking such blatant references from films. Another one is Trishul having a 'female' version called 'Saajan ki Saheli' starring 'westernised' Nutan and Rekha in Sanjeev Kumar and Amitabh's roles respectively. But this is a good non-violent film. In fact, I think I'd have actually loved the film if it hadn't been for all that West-bashing. I love piya piya piya mera jiya pukare, piya piya na lage more jiya, piya aiso jiya mein. In fact all the songs listed by you are among my favourites. I agree with harvey, it might seem unrestricted, but it's quite the opposite :-)Perhaps I'm to blame partly. Coming late to the party I'm not left with much choice of songs I like. They've all been mentioned. But a new song, by Rahat Fateh caught my attention (which means a lot when a new song catches my attention). O Re Piya, from Aaja Nachle. I love this song. Even the song which I really love so much by Pankaj Malick has been posted by Harvey. I'Ve done a thorough check and didn't see this song from Baharon ke sapne. Thanks, Chris. Saajan is a synonym, yes. I agree it was silly to have three singers singing playback for Amitabh in Abhimaan, but the film itself was so engrossing, I don't think I paid much attention to it when I was watching it. And then, when you are listening to the songs, that facet doesn't interfere with the enjoyment of the songs itself. I liked the Rafi song. The song from Kali Ghata is deservedly obscure, in my opinion. It is quite awful. Jo tum todo piya is nice. Not a great fan of the songs from the eighties/nineties, though of course there are some exceptions. Not these, though. :) Though I must admit that Pi pi pi pi piya was a good song to watch on screen. Dil was one of those loud 'comedies' that were the norm during that period. Aamir looked good on screen, but the film itself wasn't worth much. Anuradha Paudwal was a damn good singer. I know the song you are talking about in Hero and I agree that it would have been far better sung by Anuradha or even Alka Yagnik. Hi pacifist, thanks for joining in, and for the compliment. :) I remember watching Aaja Nachle and liking the film quite a bit, though I thought the settings were too sanitised. And of course, I had many complaints about many things in the film, especially Madhuri trying to be young. :) I do like the song, though. It's such a pleasant melody, quiet and there's so much yearning. *Grinning at your intensive checking of the comments* Asha Parekh is not one of my favourite actresses, but here, she is just so pretty. And Lata is at the peak of her prowess here. Especially since this is one of the few songs where they are not making her sing at the highest pitch possible! Now I am confused as to what song you are referring to. I was thinking of 'Aaraattu kadavingal' from Vengalam. Ayya.... The one I'm referring to is by Salilda. The film, Puthiya Velicham, starring Jayan, Jayabharati and Sree Vidya. (It was the remake of Phool aur Patthar. The song is beautiful, the picturisation is hideous. Another rhyming word 'diya' seems to have greater potential for pun: 'Dil diya dard liya' and 'Diya jalaao jagmag jagmag'. Loved all the songs in your post. Thanks. That is quite a list both by you and your readers. There was one song which was quite a hit during my childhood which went something like this - I do not know whether I got the words right - chhodo na chedho na main ghabara jaaoongi, mera dil dhakega main sharma jaaongi o piya, o piya. Couln't find it on You Tube, that was the only one I could think of for between you and your readers you have pretty much covered it all. Wow, between the post and the comments...what a great, big list of "Piya" songs! This is a non-film song; I haven't heard much of her singing, just a couple of film songs. Thanks for the link. pacifist, *I* can't believe I forgot this song! :( Thank you so much for linking it here. This is a very interesting tune. Do you know who the music director is? I wonder if it was R C Boral. At the begining there is something that sounds like a thermivinox and the melody is almost identical to the begining of a popular song of the 70s "Kung Fu" fighting by Carl Douglas. There is a very nice piece played by an oboe in the first interlude which is followed by a cornet and then a piano (madal?) mix not to leave out the clarinet flute oboe combine which follows the melody throughout. I've been busy for sometime now, so not really following your blog. However today evening I took a break and went through COC. Really enjoyed this list, and all the comments. Piya aiso jiya mein.. is a personal favourite also. But what about "Kaise din beete, kaise beeti ratiyaan..." from "Anuradha" (I think). Or have you restricted yourself to songs beginning with"Piya.."? I restricted myself to songs starting with Piya, yes.